On 10th August 2017, BW Monastery was gifted by Abbot Elder W Dhammarathana of Mihintale Rajamaha Viharaya, the precious relic of Buddha’s collarbone. The relic was personally escorted by the Sri Lanka Sangharaja into the premises of BW Monastery. The relic will only be opened for public viewing once a year during our Vesak Day Puja. 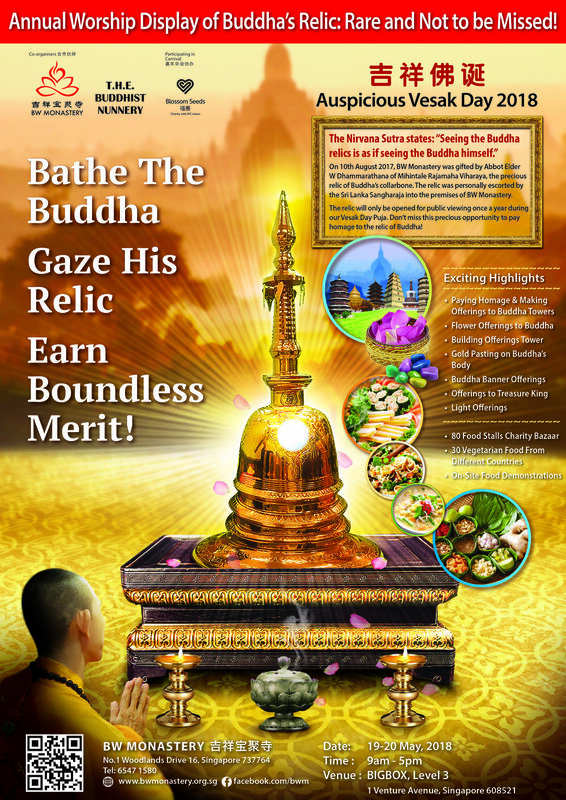 Don’t miss this precious opportunity to pay homage to the relic of Buddha! 2,300 years ago, King Ashoka’s son Arhat Mahinda of India personally escorted Sakyamuni Buddha’s collarbone relics to Sri Lanka, for it to be offered within Thuparama Monastery. On 10th August 2017, Abbot Elder of Mihintale Raja Maha Vihara gifted the precious Relics to BW Monastery. The Relics were then escorted personally by Sri Lanka Sangharaja to BW Monastery. Venue: 1 Venture Ave, Singapore 608521.